Burgundy's Château de Pommard has new American ownership. Silicon Valley entrepreneur Michael Baum has purchased Burgundy winery Château de Pommard from owner Maurice Giraud for an undisclosed sum. 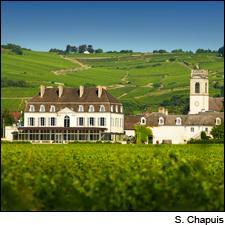 The estate includes two châteaus and a rare 49.4-acre, walled single vineyard, or clos, in the Côte de Beaune region. "He's a Francophile and wine lover. He fell in love with this magical place with its extraordinary wine," chief executive Cécile Lepers-Jopard told Wine Spectator. Both Lepers-Jopard and cellarmaster Emmanuel Sala remain in their posts, and Giraud has signed on as consultant for a year. "A new page has turned in the history of the estate, but it's not a radical change," said Lepers-Jopard. Baum has been a leading Silicon Valley investor and executive for more than two decades. He is currently CEO of Splunk, a software firm that develops products to analyze big data, as well as CEO of founder.org, a nonprofit organization. Giraud bought Château de Pommard in 2003. But at age 73, he wanted to find a buyer who shared his passion for this terroir. "With Michael Baum, we share the same vision of Château de Pommard, the same values that focus on preserving and continuing to make this national heritage shine even more," said Giraud. "This is why I decided to hand him the destiny of this unique estate. I know that he will have the heart to pursue the development of the château in the same line that has been taken the last 10 years." The historic 18th century estate has an aristocratic pedigree. The first owner was a noble in the court of King Louis XV. When the French Revolution arrived, the owners sold the castle and kept the vines in a gamble that saved their necks from the guillotine. Homeless, they built a new manor once the political situation had calmed. Eventually the original castle and the new one, along with the precious clos, were reunited under single ownership. But it was Giraud that brought de Pommard into the 21st century. He launched a massive renovation that turned this sleepy estate into a vibrant wine tourism destination. A world-class art collection includes the works of Dalí, Picasso and Miró. The combination of wine and art attracts 35,000 visitors a year, half from France and half from abroad. "We get a lot of Americans," said Lepers-Jopard. Giraud also undertook substantial work in the vineyards and cellars. In a typical year, the estate produces 6,600 cases of its grand vin and 1,600 cases of a second wine called Clos du Château, both made exclusively from grapes grown within the vineyard. But for the last three years, Château de Pommard has suffered under the onslaught of hail. "This year we lost 40 percent in the clos," said Lepers-Jopard. New projects in the works include a luxury hotel and spa, building a new cellar, and improving a Michelin-starred restaurant run by chef Christophe Queant. While the estate has changed hands four times since it was established in 1726, this is the first time it's slipped from French ownership. So far the response from the French regarding the sale of another piece of their national heritage to a foreigner has been muted. "Ten years ago the locals weren't happy because Mr. Giraud wasn't a Burgundian; it's probably the same again," said Lepers-Jopard. "But what is important is that the new owner is someone who loves the terroir and respects what has been done."